Like many Star Wars fans of ‘a certain age’, I’ve weathered my share of Star Wars disappointments; substandard paperback tie-in novels (“Han Solo at Star’s End” “Splinter of the Mind’s Eye”), the dreaded “Star Wars Holiday Special”, as well as the long-anticipated but soul-crushingly disappointing prequels. What’s kept me going as a fan was an unshakable faith in the dizzying heights that Star Wars could achieve, and still achieves on occasion. 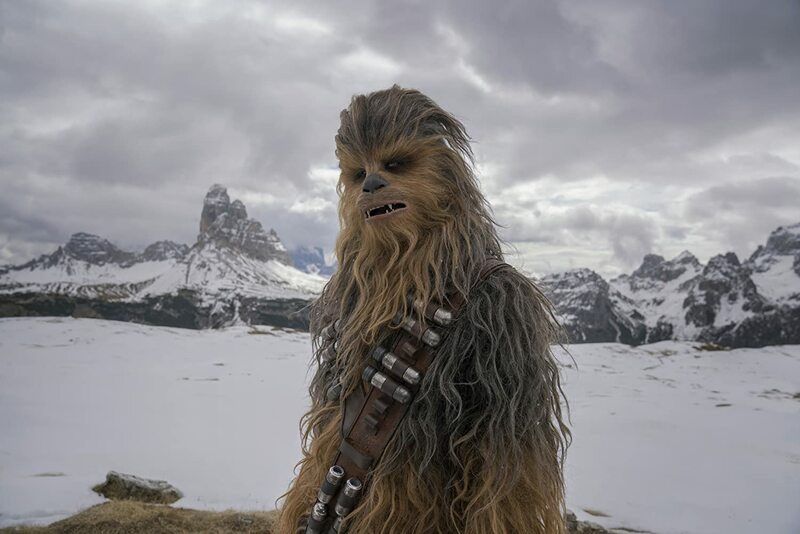 ^ “The Force Awakens”: Han and Chewie are “home” again…I’m not crying, you’re crying. At their worst, the Star Wars movies can feel like tiresome, ceaseless parades of overly slick CGI visual effects and one-dimensional characters (I’m looking at you, “Attack of the Clones”…). At their best, the Star Wars movies can feel like the very reason the art of cinema exists. It’s cinematic catnip for my generation. I will never not see a new Star Wars movie in theatrical release; it’s that simple. Lucasfilm (and Disney) have my money for life. Ron Howard (director of the near-flawless “Apollo 13”) has put together a movie that far surpassed my initial modest hopes for it . This felt especially comforting after the knee-to-the-groin that was “The Last Jedi”. Since this is a prequel to a 41 year old-movie series, a few of the major events in the life of Han Solo (Alden Ehrenreich) have already been alluded to in other chapters of the Star Wars saga. These events, while important points in the movie, are not spoilers. Any Star Wars fan worth their Kessel spice knows these events as a Biblical scholar knows scripture. 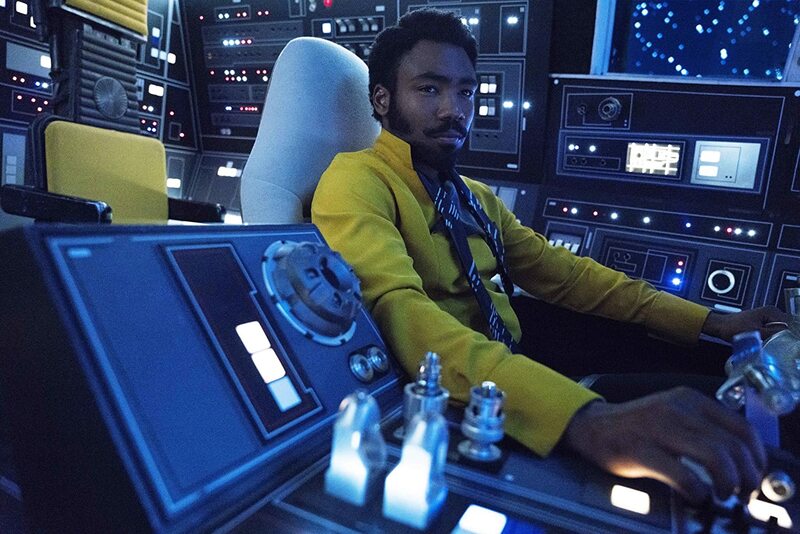 We even see Solo winning the factory-fresh, new spaceship-smell Millennium Falcon from charming, debonair gambler Lando Calrissian (Donald Glover, who owns just about every scene he’s in). Han’s befriending of Chewbacca draws on popular SW extended universe lore of Han’s helping the imprisoned Wookiee escape. No surprise really, but well done. And pretty funny, too (the shower scene…’nuff said). 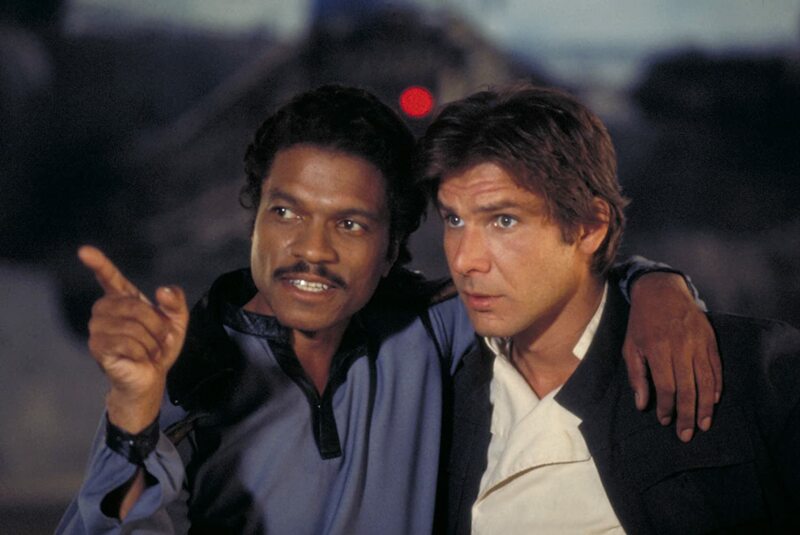 Ehrenreich and Glover’s onscreen chemistry as Han and Lando is a near-perfect match of what was generated by Harrison Ford and Billy Dee Williams 38 years ago. We see that Han and Lando never really were great friends, nor should they be. They always felt more like rivals with a healthy respect for each other. By the time they meet again in “The Empire Strikes Back,” their memories of each other have perhaps become a bit more rose-tinted with time. Bringing back screenwriter Lawrence Kasdan (“Empire…” “Return of the Jedi”) to cowrite the script (along with his son Jonathan Kasdan) was a stroke of genius. The Kasdans clearly know these guys, and have a genuine feel for their history (which Lawrence helped create). The famed “Kessel Run” is a showstopper, and it serves to ‘break in’ the Falcon; transforming her from mint-condition to the “piece of junk” we come to love in the original trilogy. The sequence is worthy of the legend. It also amends that 41 year old “12 parsecs” error; an assumed misuse of astronomical measurement that actually makes sense now. The surprises (and unexpected joys) of the film are in the details, and I will try not to want to ruin too many of those. “Solo” has a true knack for making even the admittedly predictable feel genuinely fresh and exciting. New previously unknown supporting characters round out the story of Solo’s life. 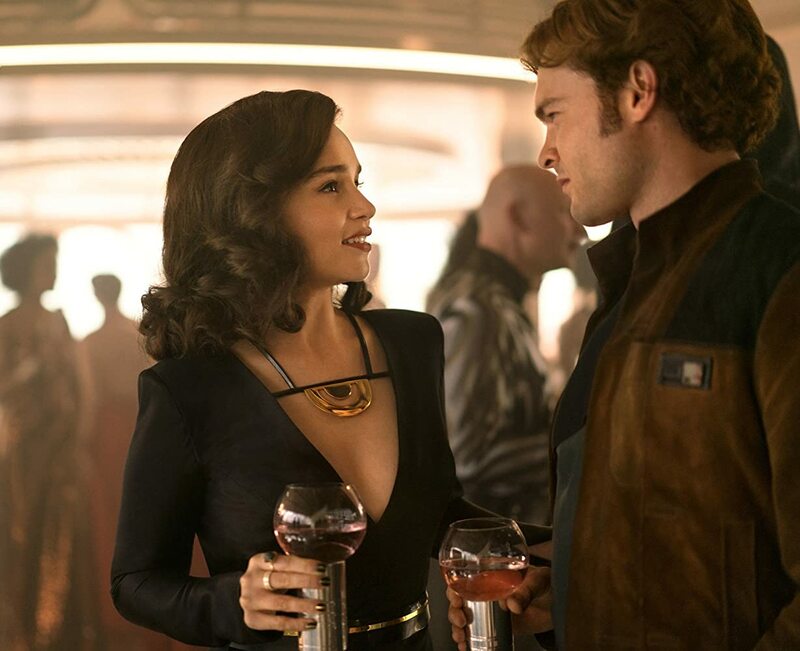 There is a love interest in the form of childhood sweetheart Qi’ra (“Game of Thrones”’ Emilia Clarke). Solo is taken in by a grizzled criminal named Beckett (Woody Harrelson). There is also Beckett’s partner-in-crime Val (“Westworld”s Thandie Newton, who was nearly unrecognizable in the trailer). There are also supporting characters who provide both comic relief and critical plot functions. Beckett’s multi-limbed, scrappy alien pilot Rio (voiced by future Star Wars TV series producer Jon Favreau) and Lando Calrissian’s mechanical copilot and permanently contentious ‘droid rights’ advocate, L3-37 (voiced by a scene-stealing Phoebe Waller-Bridge). 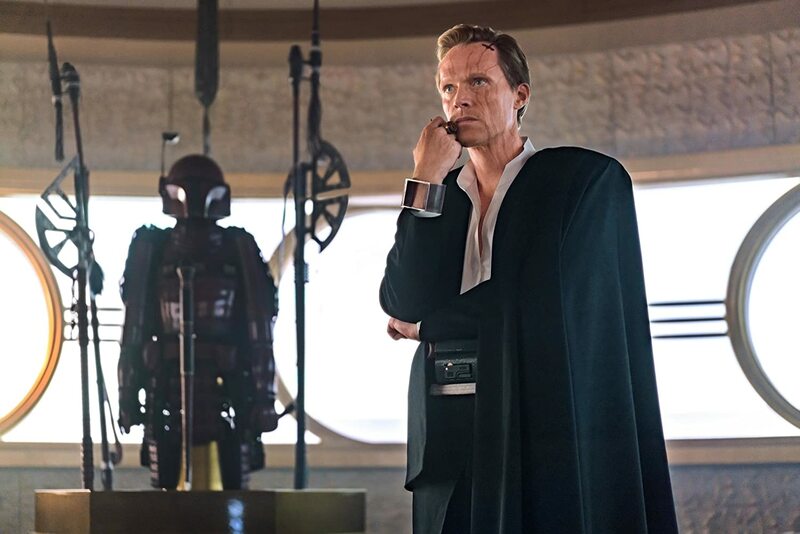 Paul Bettany (“The Avengers: Infinity War”) plays the pivotal role of scarfaced, high-living crime boss Dryden Vos, who is both puppet-master and puppet himself. Besides the all-encompassing oppression of the Galactic Empire, Vos is unquestionably the closest thing this murkier corner of the Star Wars universe has to a balls-out villain. Just as SW77 was a seamless fusion of science fiction, western, war drama, samurai epic, and fantasy genres, “Solo” blends in elements from many different genres as well. It begins like “Oliver Twist”, with the street urchins of Corellia (including Han & Qi’ra) eking out meager existences under the local, giant centipede-like crime boss Lady Proxima (Linda Hunt). 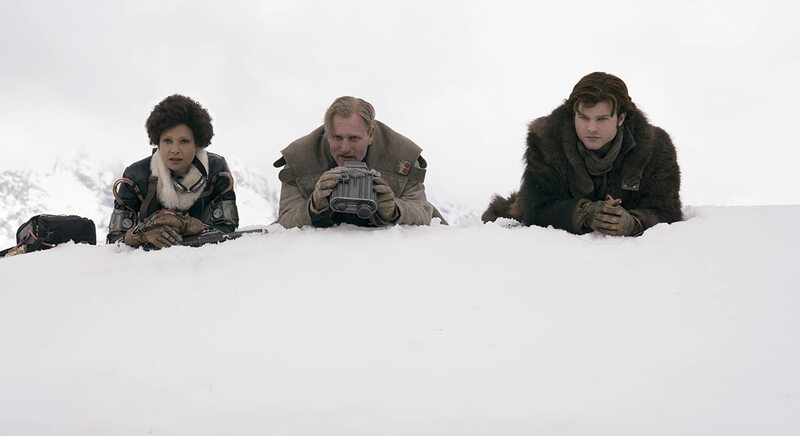 Qi’ra and Han are two kids yearning for the chance to escape. Then the movie switches gears to become a western-style caper, with Solo abandoning a failed career in the Imperial navy to join a gang of rugged outlaws for a big train heist, like something out of “Butch Cassidy and the Sundance Kid” (1969). Woody Harrelson’s mild Texan accent also tips the scales a bit. The film then flirts with Michael Mann style crime-drama, with Solo and his comrades meeting a slick, almost 1980s-style villain (Paul Bettany’s Vos) aboard his luxurious planet-hopping space yacht. Scenes taking place on the mines of the planet Kessel are reminiscent of the slave revolt epic “Spartacus”(1960). The epic Kessel Run sequence has an almost “Pirates of the Caribbean”–vibe to it, with a rogue, outgunned little vessel facing a hostile navy lurking out beyond the fog and underwater rocks (or in this case, asteroids). There are many uses of John Williams’ magnificent original trilogy music, such as his four note-musical motif used in SW77 to describe star destroyers and the Death Star (“Duuu-da-da-daaaa!”) and an Imperial recruitment video that uses an oddly patriotic-sounding version of the dreaded ‘Imperial March.’ There is also a strategic use of the “TIE fighter attack” theme used in SW77. What is new to the mix is a Han Solo theme (also done by Williams), and a somewhat epic-western sounding score by John Powell (“Bourne Identity” “How to Train Your Dragon”). The two composers’ styles complement the other (even if Williams’ iconic music tends to sometimes dominate). Overall, the collaboration between the composers works. Ron Howard has just the right touch of warmth and comfort with ensemble casts to make the material truly come alive. Howard’s taking the reigns from original directors Phil Lord and Christopher Miller (and reshooting roughly 70 percent of it) was, in hindsight, a smart (if costly) move. 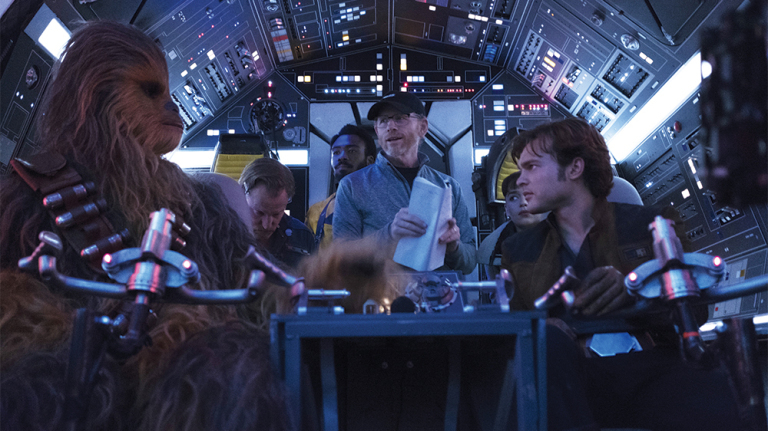 The movie has just the right balance of sentiment, freshness and immediacy to make it an all-around crowd pleaser, both to old codgers (like me) who grew up with old-school Star Wars, and to younger audiences. Much of the movie’s freshness comes from the actors. I’ll admit, I had plenty of doubt regarding Ehrenreich’s casting in the lead role, but I am also very glad to admit that I was wrong. Donald Glover’s Lando is inspired (I loved his role in 2015’s “The Martian”, as well as his standup). Emelia Clarke, Woody Harrelson, Thandie Newton, Paul Bettany and Phoebe Waller-Bridge all deserve a round of applause as well. “Solo” has plenty of twists, turns and memorable characters to prevent it from being too predictable or boring. If anything, knowing some of the broad strokes of the story beforehand allowed me to venture even deeper into the rich details of the movie’s universe. It’s still entirely arguable that “Solo” didn’t need to exist at all. But now that it’s here, I’m surprisingly glad that it does. But it’s Emilia, not Amelia, Clarke and Alden Ehrenreich, not Ahren… 😉 Sorry to pick nits, but I hate seeing my name spelled wrong and try to get other people’s names right. This was a fun ride! And watching Solo and SW77 back to back was fun. I squeed when I saw the “luck cubes” Solo and Qi’ra kept giving each other back on the Falcon in the first movie. 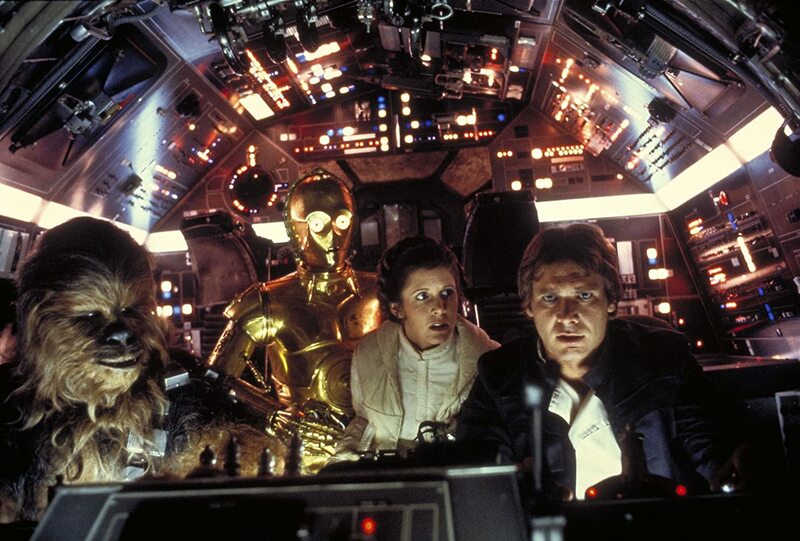 You can see them too the first time Han enters the cockpit, but blink and they’re gone. Ehrenreich and Clarke have the sort of on-screen chemistry we haven’t seen in the SW universe since Ford and Fisher. Apollo 13 is one of my favorite movies ever in any genre, certainly in part thanks to Ron Howard. I’m just disappointed that it’s not doing better at the box office. It’s an enjoyable caper film. Not necessarily a grandiose epic, but a fun movie all the same.